The remarkable heat in London over the past two weeks has led to a few questions from readers as to the best way to stay cool in tailoring. Here are my top five tips. Linen is a wonderful cloth: breathable and cool to the touch. Although each has other benefits, ceteris paribus I vastly prefer it to cotton, fresco or other high-twist fabrics. Linen will wrinkle, of course, but go for an 11-ounce weight or heavier and the effect will be reduced. And you don’t need to have it in cream or tan either, so there need be no concerns about associations with colonial overlords. Navy linen can be nice, and my favourites are chocolate, tobacco brown and grey. “But it’s hot today, and I don’t have a linen suit.” So first thing: take off your socks. If you generally wear over-the-calf socks, like me, this can make a vast difference to the coolness of your legs. It goes against the point of over-the-calf, of course, as you are exposing ungentlemanly leg hair, but needs must. The look is particularly effective when everything else is formal: navy cotton suit, shirt and tie, calf slip-ons…and bare ankles. If you find this uncomfortable, try the cut-away socks that sit below the line of the shoe – often called trainer socks. Trunk in London sells some good Tabio ones, as does A Suitable Wardrobe. Keeping the sun off your head keeps you cool. You may feel sweaty – and cooler, therefore, when you take the hat off – but the direct sun is always hotter. So wear a nice panama. Not a tiny little trendy trilby, but a proper hat. If you want to avoid those colonial associations, again, try it in a colour other than cream, such as Brent Black’s caramel-coloured Safari editions. And wear it with a bit of panache. Think Jude Law in The Talented Mr Ripley: cocked back, or tipped to one side, with big bronzed grin. There are lightweight versions of almost everything you wear. Lightweight shirtings, lightweight chinos, linen socks, unlined shoes and of course lightly constructed jackets. The problem with all of them is that the weather is rarely warm enough for long enough (at least in the UK) to justify it. There will be perhaps three weeks a year when I think I really need a lightweight shirt. The one item that I think it is worth investing in is a Neapolitan jacket. Anyone can use a lightweight cloth, but I have tried summer jackets from four English tailors and none of them compare to a Neapolitan construction. Get one in a lightweight wool/silk mix, and you can wear it with a cardigan when the weather cools down. You can wear more clothes in the heat than you think. First, it is often cooler to be covered up, as mentioned under point 3. Direct sun on the skin is the enemy. And second, you get used to wearing more clothes over time. Even in the depths of winter, most men today would feel weird in mid-weight flannel, because they’re not used to it. Try wearing that lightweight Neapolitan jacket for a few days and see if you get used to it. Picture: At Camps de Luca, Paris. Hat just out of shot; stiff Corthays not quite suited to going sockless. You can follow the discussion on How to dress in hot weather by entering your email address in the box below. You will then receive an email every time a new comment is added. These will also contain a link to a page where you can stop the alerts, and remove all of your related data from the site. Hi Simon, brilliant article. I also prefer wearing more clothes in the heat, because I tend to feel undressed wearing only a shirt or a t-shirt. But what I worry about is the increased volume of sweat ruining a jacket. I once inherited a suit that had been worn in a a very warm climate and even two dry cleaning did not get the odour out. Also it stands to reason that bespoke suits would suffer from this problem more than RTW, because of the higher armholes. Any thoughts? Have you moved on from Graham Browne? D Major in Fulham is only slightly more expensive than Grahame Browne and are full bespoke. D for Dimi, the cutter there is there Dimi Major’s son. Thanks, I haven’t tried them. There are a good number of bespoke tailors in London that are closer to £1500. Full bespoke, like GB. But I know GB, they are great value for money and they are very creative to work with. Living in a tropical climate, I have one addition to tip 5: wear an undershirt. Even though that may sound counter-intuitive, it keeps your shirt from looking all crumply and sweaty. What is the suit you are wearing in the photo? In short, that suit in your photograph is simply stunning and you look incredibly stylish and sophisticated. Can you confirm the material and the choice of hose. Absolutely. Love those shoes. Bought them over three years ago, from Leffot in New York the week it opened. And they’ve been polished under watchful eyes both at Corthay in London and in Paris. Wonderfully made things – a high heel cup, for example, which holds the foot much better. Air conditioner nightmares in summer, over heated offices in winter, giving one no chance to climatise. Climate control used to be a good suit. What are your tips for matching shirts, ties and shoes to a white or off-white linen suit? I original chose pale blue shirts and a pink tie, but quickly realised that I looked like one of the gangsters from The Untouchables. 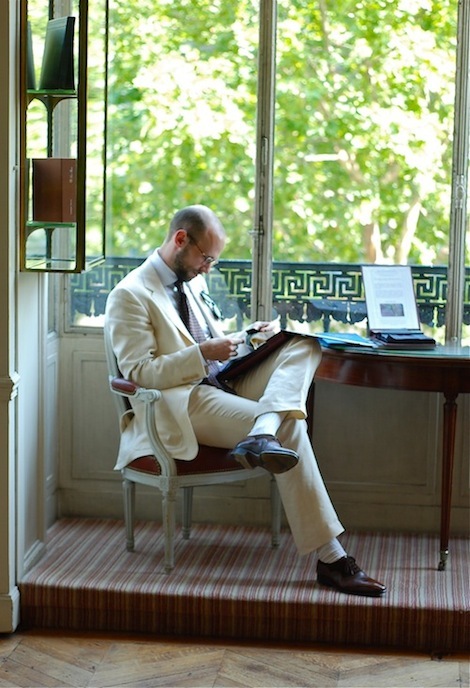 I am also far from convinced by the light tan Oxfords from Rosetti which I generally wear with white linen – something closer to the vintage oak in this picture would, I suspect, be both more mature and stylish as well as a better match for colours. Any advice? Having recently received a pair of fresco trousers and a pair made from fabric from H&S I would be interested in trying linen (or a linen combo) for next summer. Could you recommend a few cloth firms and their book names? Also, is 11oz the right weight or would you ideally recommend something heavier? This sockless notion has got to stop! It really is a bad joke. If you wear good leather shoes with cotton or fine wool socks your feet stay cooler than anything else. Pull on some socks and get over the heat,I work in a welding shop so know something of serious summer heat. I’m currently working with a client who insists on a very informal dress code. I’ve found the Riviera polo shirts from Sunspel to be excellent, both for beating the heat and looking acceptable to me and the chaps I’m working with. Overall, I’m not a fan of the sock-less look either. I think it can be passable without a tie or wearing a polo shirt because of the casual look. But when a tie is added to a suit, even a linen or cotton suit, it brings up the entire outfit and bare ankles just seem too stark and out of place in my eyes. Oh well, to each his own. I am convinced and want to have a linen suit made up. Would it be better to use a Neapolitan tailor or a British one? For functionality a Neapolitan tailor seems sensible, less lining. Or maybe a tailor like Anderson and Sheppard, with their drape cut? It depends entirely on what look you want. The cloth doesn’t have that much to do with it – the English will be much more structured and formal (even A&S), the Neapolitan much more casual. I live in Seville (Spain). From June to September, during the day, temperature remains over 35 degrees celsius and sometimes even over 40. My advise is: do not wear a suit. If you have to wear one, just go to any other city by the sea or head north to another country with temperatures compatible with life. Always glad to read advice on keeping cool. I’ve had a few linen suits and jackets which look great for about an hour then I begin to look like I’ve slept in it. I do think more work needs to be done by manufacturers on the subject of lighter weight fabrics, there’s a huge market. Holland & Sherry have made strides in this area. Cotton farming issues may also be impacting on availability and sending weavers to explore new fibres. Linen is a great staple for any wardrobe though maybe I need to select a better one. I totally agree with the sock tip though. I was wondering, in relation to this, what the best cotton weaves are for hot weather, in particularly for dress shirts.